1 of 2 Stir beef, onion, ginger, garlic, chile, vinegar, molasses and 2 tbsp of the soy sauce into slow cooker. Pour in beef stock. Cook on HIGH for 6 hours or LOW for 8 hours. 2 of 2 During the last 15 minutes of cooking, bring a large pot of lightly salted water to a boil. Add udon; cook for 2 minutes. Add bok choy and cook for 2 more minutes. Strain. 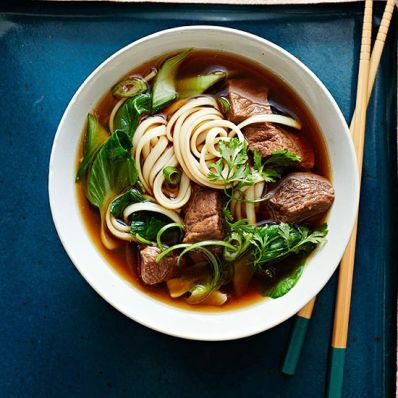 Add noodles, bok choy, scallions, cilantro and remaining 2 tbsp soy sauce to soup. Stir and serve. Garnish with extra scallions and cilantro.